Ron Whitten, Michael Hurdzan and Dana Fry were the creative geniuses behind Erin Hills. ERIN, Wisconsin – The first thing you notice is the scorecard. The official yardage for Erin Hills at the 2017 U.S. Open is whopping 7,693 yards. That may make it the longest course in the 117-year history of the U.S. Open, though U.S. Golf Association staffers on site weren’t ready to confirm that. The par-5s are No. 1, which is listed at 560 yards but could play as long as 608; No.7, listed at 607 but could play as short as 576 or as long as 619; No. 14, listed at 594 but could play as long as 650; and No. 18, listed at 637 but could play as long as 675. The tourney is June 15-18, 2017 – the first U.S. Open ever played in Wisconsin and the first one in the Midwest since Olympia Fields hosted in 2003. Golf’s biggest event has sites set through 2026 and none of the succeeding ones are even remotely close to the Midwest. 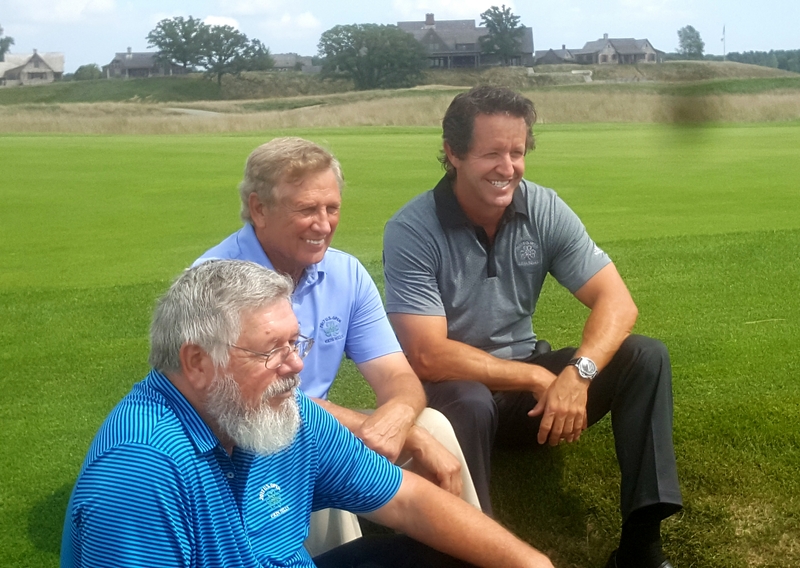 Both course superintendent Zach Reineking and the architectural team of Michael Hurdzan, Dana Fry and Ron Whitten were on hand for the preview day and joined Hall and the media contingent on the tour of the course. Erin Hills will be open for public play through Oct. 6, and then the public won’t be able to play until after the 117th playing of the Open next June. Hall set the greens will be in the 13 to 13 ½ range for the Open and will be slower than the surfaces this year at Oakmont. Few changes have been made since Erin Hills hosted the 2011 U.S. Open. The only notable one is at No. 3, and that wasn’t a major thing. Reineking said 385 trees have been taken down in recent years and only six are left. None come into play except perhaps the only at No. 15 – and the future of that tree is in doubt. Since last year a new, elaborate practice range has been built near the clubhouse and parking lot. The USGA estimates the economic impact of the 2017 U.S. Open on the Milwaukee area at between $120 and $135 million. Community support has been outstanding. The USGA needed about 5,000 volunteers and received applications from 7,956. More than half of the volunteers were from Wisconsin and 52 were from foreign countries. Though the planning remains a work in progress, tentative plans call for two spectator parking lots, both free to those using them. The USGA will open its merchandise online shop on Sept. 8. Though Erin Hills is built on 652 acres the USGA is planning for 35,000 spectators per day. The ticket sale was launched in June and sellouts for the four tournaments are expected. The four tournaments rounds have been sellouts for the last 29 years. 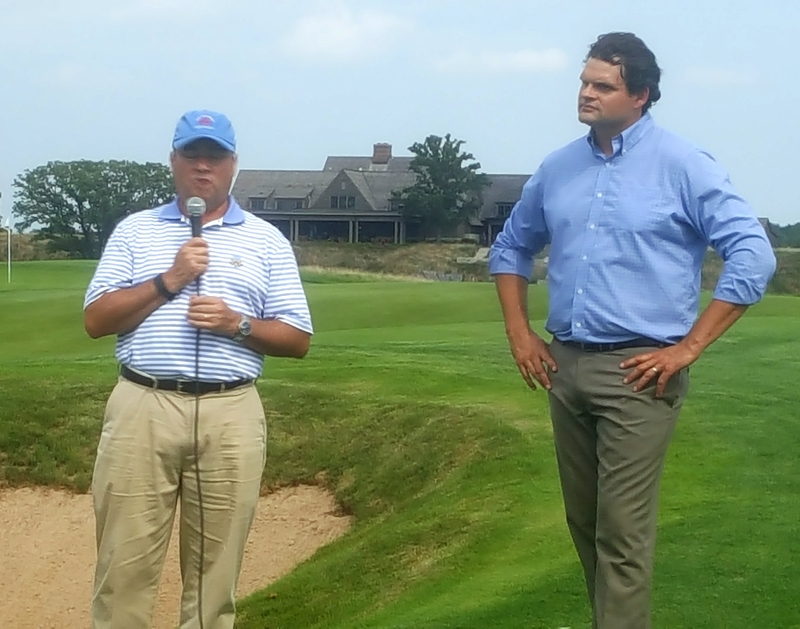 The USGA’s Jeff Hall (left) and superintendent Zach Reineking provided an inside look at Erin Hills.